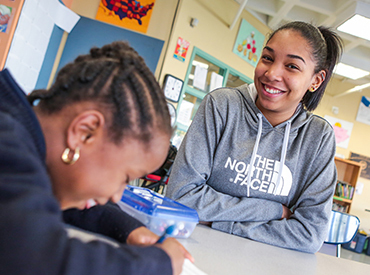 Volunteers are critical to the work we do at Boys & Girls Clubs of Boston. We are always looking for both individuals and groups to offer their energy, time, talent, and skills to enrich the lives of our youth and keep our Clubs in top condition. Come join the team of talented and dedicated volunteers we are fortunate to host. Together, we can have a lasting impact on our members. Boys & Girls Clubs of Boston strongly believes in the valuable role that volunteers play in transforming the lives of our members! BGCB strives to provide meaningful and valuable volunteer experiences for individuals and groups looking to give back. You have the power to make a difference! Volunteering with BGCB provides new experiences and skills, as you serve as a role model to youth and positively impact the communities we serve! Individuals serve in a variety of capacities based upon Club needs and volunteer interest and availability. Volunteers may support youth with homework, assist in program areas with the daily activity, coach, or help with administrative tasks, to list just a few. Please note that a copy of your government issued ID, i.e. driver’s license, birth certificate, passport, etc. must accompany the CORI form. Explore our current volunteer opportunities or complete the inquiry form below to get started. Boys & Girls Clubs of Boston welcomes groups from corporations and other organizations to enhance BGCB’s programming and facilities. Our group volunteer opportunities provide a meaningful, productive team-building experience while fulfilling a need at one of our 11 locations! Volunteer group projects may include Club beautification, supporting Club events, hosting members at your office, or hosting a goods drive for a Club! Please provide information regarding your group such as availability and the type of project you hope to do by completing the inquiry form. If you are an individual looking for a volunteer opportunity with BGCB, please complete this inquiry form! If you are a corporation, organization, or group looking for a volunteer opportunity with BGCB, please complete this inquiry form!